The dry lake bed blew me away, so to speak. It’s hard to imagine a better arena for blokart racing. The bed surface was very hard and the kart reached terrifyingly high speeds quite quickly. 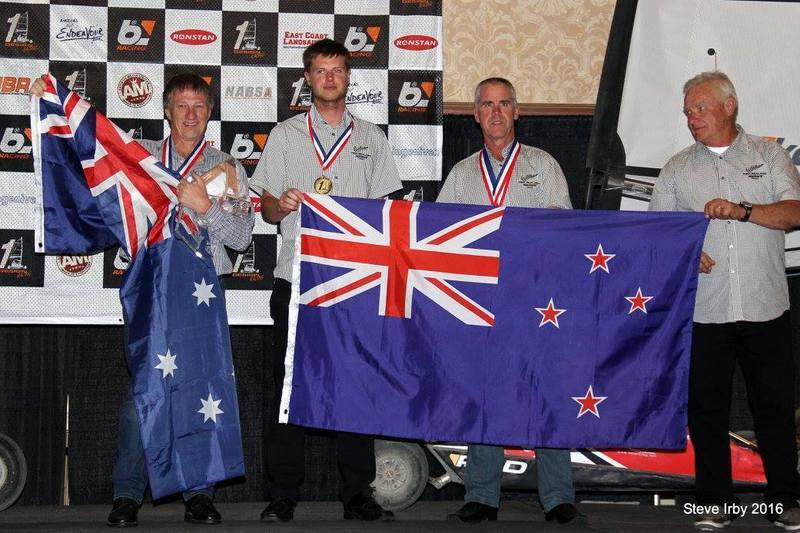 Michael recorded an impressive speed in one of the races of 83km/hr, sailing into the bottom mark next to Ray Kelly in the production karts. I don’t use a GPS so I can’t comment on my speeds, but I can say that I went pretty quick too! The courses were nice and long and gave the sailor plenty of opportunity to go wherever they liked. The course was unfortunately a bit shorter for the World champs because of the venue change, but did offer the windward/leeward components with plenty of upwind tacking that I had been fantasizing about for months. When the breeze was light it shifted around a lot, sometimes up to around 40 degrees. This meant that if you were on the wrong side of a large wind direction change you were instantly looking at the back end of the fleet. These changes were very irregular and hard to predict, so you had to be extremely conservative in where you placed yourself. To be on the inside of the fleet at all times was the safest bet, and you had to avoid the corners and the lay lines. The wind also varied in strength too, making it difficult to feel confident in choosing a sail size. You had to resist the temptation to take risks when the conditions were variable. To win a leg by half a lap or by 100th of a second (which happened!) meant the same amount of points on the score board. It always paid not to separate too far from the fleet in the case that things went pear shaped, and if you had a lead, it usually paid to put a loose cover on the competition. When the breeze was up it was awesome. The direction was more consistent and oscillated more regularly which meant you could sail your own race and not worry too much about the fleet. It paid to start at the favoured end of the start line with speed and stay a second or two late so that you didn’t risk being over the line early. The downwind was super-fast and I learnt quickly that it paid to do only one gybe. The downwind legs were very long, especially for the North American Champs, and to judge where to gybe so far from the bottom mark was quite difficult at first. If you gybed too early you likely had to suffer sailing low and slow to the bottom mark, or do two short gybes which is never good. If you gybed too late you were in danger of having other karts sail a shorter distance on the inside of you. Barry Cole from Auckland was my biggest competition. After about 8-10 minutes of racing in the higher wind speeds we would still be neck and neck, and finishing within seconds of each other, sometimes even when we went with different sail sizes! It was tough work trying to stay ahead of that rascal, and in hind sight we both sailed without making major errors which made for fair and exciting (and stressful) racing. When it was that close sail selection was very important, and I was sometimes late getting on to the grid and entering the dial up because of a last minute strategic sail change. Large gusts carrying dust often came rolling down the course. In one race, I had worked up a nice lead in the first lap and sailed right into a massive dust squall downwind. Visibility vanished and I suddenly had no idea where the mark was and which direction I should be sailing. This was quite unsettling as Wayne from ABC lost his first place in a super heavyweight race earlier by missing the mark completely because of visibility issues. I aimed my kart to roughly where I thought the mark might be, and miraculously the mark came flying out of the unknown just to windward of the line I was sailing, and I had a near perfect rounding around it! I got pretty cool video footage of these races and look forward to sharing it later. Barry Cole and the rest of the Auckland team were often seen watching their anemometers intently, and they were always seen changing mast section configurations more often than sail sizes. Barry was noticeably faster than me with the 5.5m sail so I tend to think they have found some mast section combos that work well. This is something that I will have to think more about before the next event. In one of the races the wind died completely as I was leading the fleet up to the top mark in our final lap. All karts on the lake stopped in the calm, and the finish flag went up soon after. Unfortunately someone at the back of the fleet crossed the finish line after the finish flag went up, which meant that the committee couldn’t abandon the race because of lack of wind – everyone had to either finish or pull out. Barry Cole who was behind me started wheeling with intensity that I have never seen. I started wheeling in an attempt to protect my position but was no match for the others who were prepared to wheel harder. It was sweaty work under the dessert sun! We wheeled all the way to the top mark and the fleet continued to wheel to the downwind mark, far away in the distance. I wasn’t prepared to work that hard, so I just wheeled myself over to the side of the course where I thought the wind would fill in from next and waited patiently. This turned out to be a mistake because I inevitably ended up wheeling all the way to the bottom mark and a chunk of the fleet had wheeled themselves past me! This took forever, and the wind finally filled in when I was about 40m from the finish line, which I crossed in almost last place. Luckily it turned out that I had done a lap more than most of the fleet so I ended up with a manageable 3rd place for that race. I owe a big thanks to the people that helped me get to Nevada and have a great event. Terry did an incredible job of organizing the house in Las Vegas, the rental vehicle, flights and accommodation in LA and also doing the race timing for both competitions. Bob really looked after me by offering his time and famous services and advice with kart setup and maintenance. The ladies of the house: Iarene, Lynette and Raylene looked after me with their support behind the scenes, excellent home cooking and their attempts to try and get me ready to leave the house on time in the mornings. Michael for lending me a 2m sail which I unfortunately never got to use, being a good roommate and getting me into the flash airport lounges. Davie Norris for offering his 3m sail for me to use. I used it often and was very competitive with it – thanks a lot for that Davie. Thanks also to the rest of the Canterbury team who helped make it a trip that I won’t soon forget. It was great to see Canterbury do well. Congrats to Michael and Terry. The rest of the team had some excellent races too and proved that they are indeed capable of being competitive at such a high level. That’s all from me for now, see you Sunday.